If you want to avoid trips to the post office and handle all your physical mail from home, you can print stamps online. You’ll save time and money by printing your own stamps from home and you will have access to all mail classes provided by the USPS, including certified mail. In this guide, we will be looking at the basic things you need to start printing stamps online, and what you’ll have to do. Printing stamps online doesn’t require any sort of special equipment. However, there a few things you do need. Below is a list of everything that you’re going to use when you print stamps online. 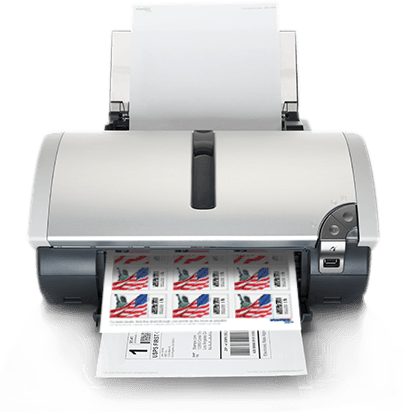 A Printer – There are certain mail classes that may require a special type of printer, but most classes, including first class postage stamps, do not require special equipment. Any regular printer is good. Online Postage Stamps Provider – You will also need to sign up for an account with a licensed postage stamps provider. Licensed postage stamps providers are authorized by USPS to provide online postage solutions. A Sheet of NetStamps Paper– First class postage stamps need to be printed on a special type of paper. This paper is called NetStamps paper. Only USPS authorized vendors can provide you with NetStamps paper – for a full list of online authorized stamp vendors see our page on where to buy stamps from. You’ll usually receive a few sheets when you sign up for an account. You can also order online from these providers, when you run out. This applies only to mail postage stamps. Shipping labels can be printed on regular paper, since they have built-in security measure. You can purchase it from the stamps.com store – for more details on how to use stamps.com, check out our guide to the stamps.com trial account. Weighing Scale (Optional) – If you only send regular-sized letters, you won’t need weighing scales. However, if you’re sending larger mail, you need to know the weight of your mail. Weight will factor in the overall cost of postage stamps. You’ll need an accurate scale that can measure ounces. First, you’ll need to sign in to your online postage stamps provider account. The official service recommended by the USPS is stamps.com. Click on the tab that says “Print Postage Options”. This will open a new window. Fill in details about your delivery. This includes the weight and size of your mail or package, as well as the address of the sender, and that of the receiver. You’ll also have to choose the service type. There will be a special field in which to write the NetStamps code. You can find the NetStamps code on the top of the NetStamps paper sheet. Choose whether or not to apply special services to your delivery. Lastly, you can select whether to print a full sheet of postage stamps or a set number. Bear in mind that the postage stamps need to be printed on the appropriate side of the NetStamps paper. Make sure you load the sheet so that the stamps are printed correctly. You can reprint a sheet of NetStamps once, at no additional cost.